I recently had the pleasure of being elected President of the board of directors of the FDOA. I have been a participant at SportsAbility since its first year way back in 1990. I remember going that first year to Lake Bradford in Tallahassee and being able to take a pontoon boat ride on that lake and seeing how big it was, and all the cypress trees and the beautiful views near the Junior Museum. There were also many other fun activities I participated in. I also enjoyed socializing with many of my other friends with disabilities in the Tallahassee area. I continued participating in FDOA activities since then and think I have been to every SportsAbility in Tallahassee. When David Jones, the FDOA Founder, organized a board of directors in 2000 and asked me to be on the board, it was an easy decision to make. Besides SportsAbility, I have participated in many activities and helped to promote this organization statewide. While the FDOA is a sports oriented organization that promotes "Active Leisure for Life," the board meetings are serious as it takes a lot of organization and money to run the FDOA programs. However, it is worth every bit of my time to help assist this organization to promote these programs to help all people with disabilities and their friends and family to enjoy sports and active programs to help keep them healthy and involved with their community, and to live life to the fullest! Active Leisure for Life! While students are getting into the school year studying and doing homework, we shouldn’t forget about making sure that children are included in physical education. The benefits of physical activity include increased mobility, higher energy, empowerment and camaraderie to name a few. Here are a few resources to make sure that you are prepared. If you are thinking about advanced education opportunities, more colleges are including students with intellectual disabilities. According to Disability Scoop, “In 2004, there were just 25, according to Think College, a federally funded center that tracks, supports, and advocates for programs. This fall, 270 colleges will welcome students with intellectual disabilities.” Colleges and universities have physical education programs that may be adapted to accommodate students. Whatever your age, FDOA has a database searchable by county of accessible inclusive recreation. After the school day is done, get in some physical activity by checking out iFind, our online database on inclusive accessible recreation in Florida. This database provides information on a variety of activities. You may search by county or even by type of activity. You may be surprised at the programs that are near you. If you see something that is missing (that pertains to recreation) or information that needs to be updated, please let us know at [email protected]. The 20th annual Family Cafe and SportsAbility Sampler was very successful. The event saw over 11,400 registered individuals, 207 breakout sessions that covered topics such as inclusive recreation, assistive devices, and career paths. FDOA staff and volunteers had a wonderful time sharing information and hands-on experiences on the needs and benefits of recreation and physical activity! FDOA had booths on everything from sit water-skiiing to adaptive biking. 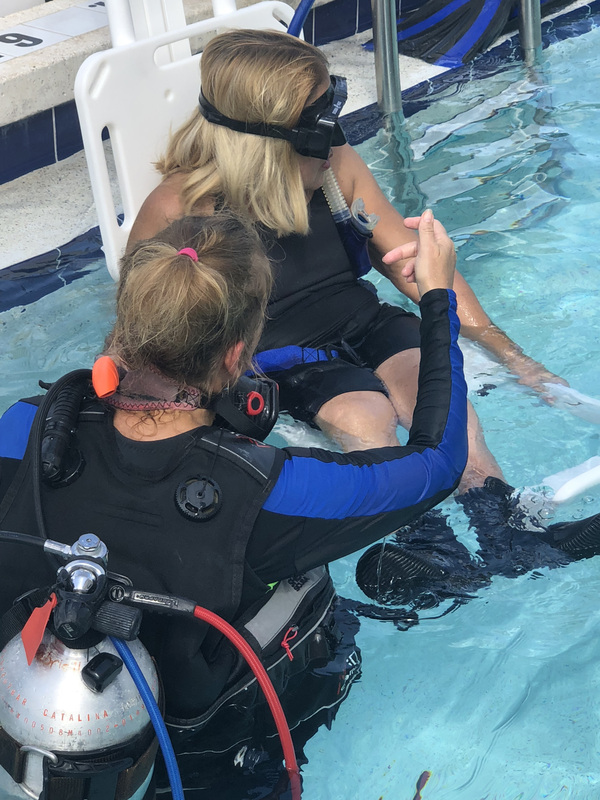 Experts from Life Worth Leading provided an adaptive SCUBA experience. Florida Fish and Wildlife Conservation Commission provided archery. US Tennis Association was on hand introducing participants to tennis. Hoverball was provided by Removing the Barriers Initiative. People were able to maneuver the twists and turns of an accessible obstacle course. People were even able to try their hand at paddleboarding in the pool. The entire program was possible thanks to Gatorland Orlando! Gatorland provided an entertaining and educational animal program. Participants learned about Florida animals first-hnad. They even shared information about their wheelchair accessible zip line! Crowds gathered for the annual Rubber Duck Race! Almost 500 ducks raced down the big slide hoping to be the lead duck! Over 100 prizes were given away! SportsAbility Tallahassee April 11-13, 2019: Registration is now open! Assistive Technology has become very advanced in recent years and has greatly increased the quality of life for people with disabilities by expanding their recreational play, home life, and schoolwork abilities. With the growth of Assistive Technology (AT) there has also been an expansion of ways to find funding to acquire the devices that you may require. The first place to look for funding for an AT device is through your insurance. In an article about funding AT from the Early Childhood Special Education, Susan Judge goes over how private insurance coverage can vary considerably between plans and companies. In order to fund an AT device through insurance, a prescription from the child’s doctor is required as well as an explanation why funding is necessary. She reassures, however, that in the event of a denial at first, “appeals may lead to a reversal of an adverse decision”. If insurance doesn’t cover the cost, there are many more options available. Grants and low-interest loans are a great way to receive funding for your child’s device. Grants are a sum of money that are given by another organization or the government for a specific purpose. There are a number of grants that are targeted for people with disabilities and acquiring AT devices, some of which you can find here HYPERLINK. It is also helpful to search through community based organizations or businesses as a last resort for sponsorship, such as Lions Clubs or Rotarians, but to be sure to include documentation of failed attempts at funding through other resources and to be able to cover at least part of the device yourself. The Assistive Technology Act (ATA) created over 30 loan programs for AT, specifically “any item, piece of equipment, or product system, whether acquired commercially, off the shelf, modified, or customized, that is used to increase, maintain, or improve the functional capabilities of children with disabilities”. The Florida Alliance for Assistive Services and Technology (FAAST) highlights the New Horizon Loan Program on their website HYPERLINK, which was established under the ATA. Judge also mentions the Individuals with Disabilities Education Act (IDEA) requires that assistive technology be provided by public school districts if the AT device is necessary to fulfill the child’s Individual Education Plan (IEP). Schools may seek out grants or funding from alternative sources to provide the child with the device. However, the device could still greatly enhance the child’s quality of life by being able to participate more independently in school and recreational time. Penny Reed and Paula Walser also go over the IEP in their article, Funding Assistive Technology, and say that if the AT device is also required for home use and the IEP committee approves, the technology still must be provided by the school district. The IDEA also confirms that “if parents provide the device for a child in order for his/her IEP to be implemented, the school must assume liability for the device”. Tamara Simmons, author of The Funding Guide for Children with Disabilities, a free e-book, shares tips to increase your chances of receiving funding when seeking from organizations or grants. Her biggest tip is to follow the instructions set by the organization, such as paying attention to the geographical location, the relevancy of the AT to your child, and following the page length carefully. She also suggests getting quotes from multiple resources for the same product and applying to multiple at once to increase chances of funding. Applications typically have an area to explain what use the device will have for your child, and Simmons mentions that funders often say “never type using less than a 12 point font so you can squeeze more information unless the guidelines state to use a smaller font”. Lastly, she and other professionals recommend always sending a photograph of your child with the AT because “the adorable image of your child enjoying the device that will change his or her life will get you a long way in getting the monetary assistance you need”. Please help someone with a disability learn how to benefit from physical activity! You may think that small donation won't make a difference, but it truly does! Each person contributing a small amount makes an impact on someone's life forever! Please donate whatever you can to help a person with a disability experience the benefits of the physical activities.